Sprawl's always-interesting Interplay festival returns to The Spitz tonight with the fourth instalment in its ongoing series of digital art collaborations. For over a decade Iris Garrelfs and Douglas Benford's collective have brought us events from some of the most exciting names in contemporary experimental electronic music, with past Interplay rosters including Jan Jelinek, Frank Bretschneider and Pole. Focusing on collaboration in the hopes that "unlikely - like - minds meet each other and establish lasting relationships", the series' pairing of artists gives audiences a chance to hear two sonic worlds collide as well as perhaps witness the birth of new musical duos. Leading tonight's bill is a collaboration between German multimedia artist Thomas Köner and sound sculptor Max Eastley. No strangers to working together, Köner and Eastley jointly produced the installation piece "List of Japanese Winds" in 2000 for the Hayward Gallery. We can only hope Eastley brings out The Arc, an electro-acoustic monochord of his own creation. Its unique range of sounds combined with Köner's glacial ambient drones should keep us aurally dreaming well into the weekend. Equally engaging will be the improvisational duo of master sound manipulator Ekkehard Ehlers and circuit-bending musician Brian Duffy. 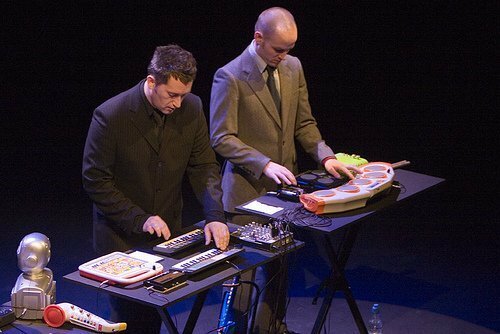 Duffy will appear with his Modified Toy Orchestra, a collection of electronic toys transformed into wonderfully bizarre instruments through his electrical wizardry, while Ehlers will twist existing music into new works. To round out the line-up, Sprawl founders Iris Garrelfs and Douglas Benford (si.cut.db) will perform a set for computer, electronics and voice. Interplay 4 sees Sprawl's ambition expand beyond London to reach Bristol, Dublin and Amsterdam, as the same core line-up tours all four cities this month. Our western readers not inclined to travel to the capital on a weeknight can head to the Bristol gig tomorrow at The Cube Microplex, while our Dublin friends can make a proper late night of it, as Interplay comes to their city on Saturday. Sprawl presents Interplay 4 on Wednesday 20 June 2007 at 8 p.m. at The Spitz, 109 Commercial St., London, E1 6BG. Tickets cost £10 each and are available on the door or online here. Image taken from comcinco's Flickr photostream.